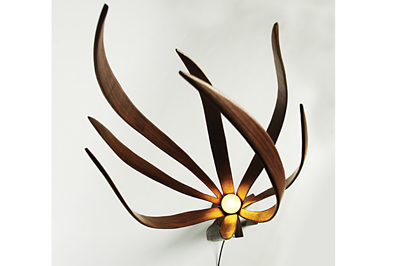 Alex MacMaster launched 'MacMaster' in 2009 specialising in contemporary lighting and furniture products. The creative studio is run by two award winning designers, Alex MacMaster and Limahl Asmall, who share a passion for exemplary design and an appreciation of the many time constraints busy clients are burdened with. MacMaster provides a high-end, made-to-order service. Not quite bespoke, but certainly a tailored service. 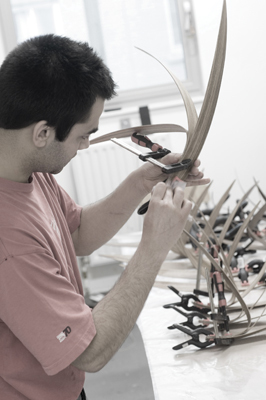 Managing the making and production in house gives them the flexibility to adapt to their clients' needs. They can meet shorter lead times if necessary, and can prototype and move to production far quicker. Their workshop is also a beautiful place to spend the day, with natural light, abundant space, and lovingly restored 1970s Wadkin and Sedgewick machinery. Alex and Limahl both spent much of their childhood either deconstructing objects and toys, or building things, and not always their own, as Limahl tells us: "I can distinctly remember taking apart my brother's cassette Walkman and then struggling to put it back together." Though Limahl was born in London, both he and Alex grew up in the countryside - Alex in Worcestershire and Limahl in Sussex. They were both surrounded by forests which meant they could fetch timber, knock up tree-houses and build dens. This later turned into small-time commercial ventures, selling turned bowls and foot massagers. The two met at university, shared bench space and quickly realised their kindred experiences growing up. The degree course was small, with only eight graduates, and gave a liberal dose of 'designing through making experiments', a methodology they continue to utilise today which can be seen in their 'Nest' coffee table and 'Iris' pendant light. After university, Alex moved to Weymouth to train under Clive Baines, and Limahl worked an internship after winning the Young Designer of the Year Award in 2009. Limahl then went on to study for a Masters degree in Design under Assa Ashuach and Tomoko Azumi. 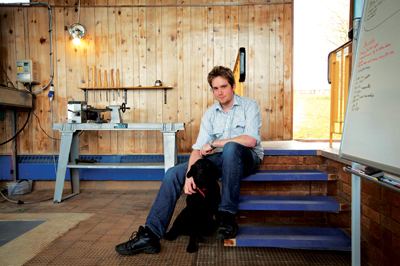 Alex founded MacMaster during his period with Clive Baines, where he was fortunate to have access to a world-class workshop, with a world-class furniture maker. In 2010 Alex moved to London and Limahl joined the company. Today their workshop is nestled in the rolling hills of Worcestershire, surrounded by forests and natural light. As you would imagine, there is some level of competition between the two designers which Limahl describes as 'healthy', and is a positive force in the duo's quest for original and successful work. "We still have a preference for our own designs," Limahl admits, "I respect Alex's originality, which is a rare trait in commercial furniture and lighting design; the 'Iris' floor light, for example, is stupendously original. 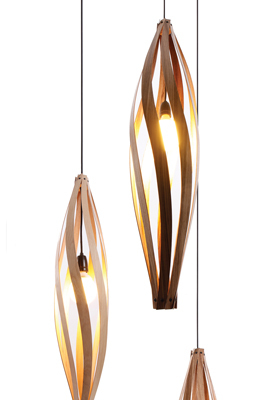 However, my favourite would have to be the simplicity and elegance of the 'Cocoon' pendant light in a trio formation." The pair recently had a shoot at a county house in Lavenham, Suffolk, with a trio suspended over the staircase, "It was simply a pleasure to see the formation of the pendant lighting interact with the curves and angles of the architecture, one enriching the other." MacMaster feels it important to make time to experiment, and consider workshop play - in which you are free to follow any whim and fancy - a powerful tool. â€œUsed in parallel with brief-initiated design, the two can produce excellent results. It is far too easy to get bogged down in an idea, in constraints. Usually, by releasing the constraints your mind naturally becomes creative,â€ says Limahl, though he also considers focus and goal-based work necessary to transform the concept into a commercial product. In terms of approach, MacMaster abides by the dictum 'minimum waste for maximum output'. 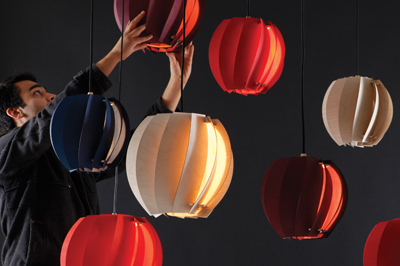 This informs their design and production cycles and challenges them to create a symbiosis between the aesthetic and function of a product, and the manufacturing techniques. They investigate the chain of processes; from materials to jigs, from finishing oils to packaging. Recently the pair investigated the waste of their products to see if there was an up-cycling opportunity. There was, and their newest pendant light, launched at Tent, London 2012, utilises the excess materials from their 'Iris' floor light. With regards to the balance of design and making, the ethos MacMaster works by is that the two rely on each other for success. â€œIf we spend adequate time refining both processes, the two can be better,â€ Limahl explains. MacMaster has been taking part in PopUp shops in London recently, and see this as a fresh opportunity to join like-minded studios in bringing their products to the design conscious market. These are usually for a month at a time, and they are always on the lookout for more locations. They had a very busy year exhibiting throughout 2012, taking in Sweden, Singapore, New York, Los Angeles, and twice in London. 2013 will see them focus more on the design and fabrication of new lighting and furniture ranges. The pair have scheduled several week-long sessions in the workshop to bring some new concepts to life. Limahl tells us, "Next year will be about production, in both senses of the word." The greatest influence on my style of making has been the time I spent working with Clive Baines, a maker and designer based in Dorset. I regard him as the most talented bespoke furniture craftsman in the country, with years of experience turning iconic designs into reality. Clive is a master craftsman who learned his skills as an apprentice and from years of hands-on experience. 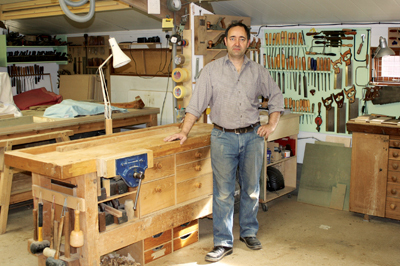 He was workshop manager at Parnham College and since its closure has been self-employed, making furniture for a well-known designer as well as bespoke pieces for Halstock.I was trained by Clive after university, which honed my craftsmanship, especially the methods of lamination and jig-making which are central to my own designs. I was inspired by his resourcefulness and ability to push the boundaries of what an individual maker can achieve. Clive is a perfectionist, and quality is never compromised. I strive to achieve this standard in my own work. For me Angus Ross is the iconic designer/maker, a Scotsman with an idyllic and beautiful stone-built workshop and showroom in Aberfeldy, Perthshire. 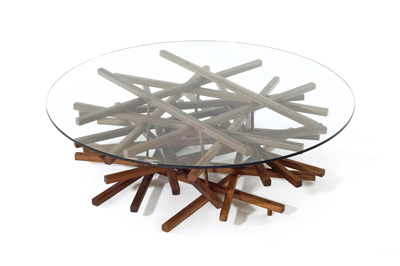 I am drawn to the authentic and resourceful nature of Angus Ross, a skilled artisan who has drawn experience from areas of the creative industry including design and manufacture. 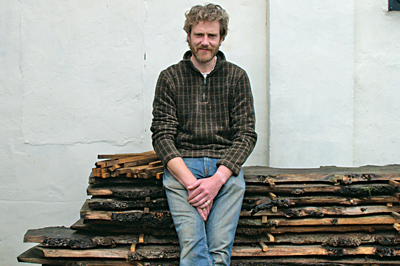 I appreciate his work for the immensely imaginative approach to timber design, and his skill of harnessing the fluidity and inherent beauty in timber; allowing the form and materials to speak for themselves. It is this incredible understanding of the relationship between design, materials and processes that draws me to his work. Be sure to pick up your copy today, or why not subscribe?